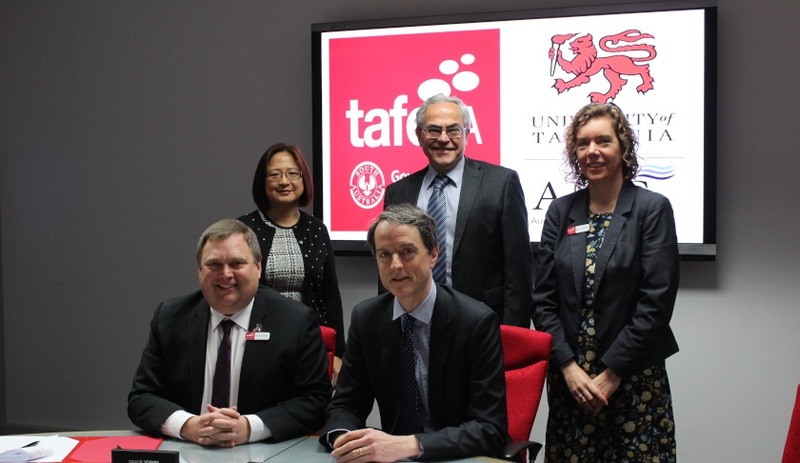 TAFE SA and the University of Tasmania’s Australian Maritime College (AMC) have strengthened their joint capability to provide skilled shipbuilders with an MOU on educational collaboration and skills development. The MOU will see TAFE SA and AMC work together to build a pipeline of skilled workers for the major naval shipbuilding projects in Australia, particularly in the areas of maritime engineering, design, project management, logistics and supply chain management, as well as boosting capability in local small to medium enterprises and adjacent and related industries. The partnership will also strengthen the institutions’ existing collaboration with the Naval Shipbuilding College (NSC) and participation on the NSC’s Delivery Advisory Council. The benefits of the partnership are set to include direct pathways from TAFE SA diploma and associate degree programs into AMC’s bachelor of engineering, bachelor of global logistics and maritime management, and bachelor of applied science (marine engineering). Other benefits will include the enrichment of existing programs and new joint programs in response to industry requirements. TAFE SA executive director, education, Brian Rungie said that this new partnership will provide a valuable opportunity for TAFE SA to bolster the education and training opportunities that South Australians have for lifelong careers in the naval shipbuilding industry. “The AMC is a world-leading maritime education provider and has significant specialist teaching, learning and research facilities which are vital for the maritime and defence industries,” Mr Rungie said. University of Tasmania vice-chancellor Professor Rufus Black said the agreement was a prime example of educational institutions working together to meet the evolving needs of industry. “As a national institute, AMC is very much looking forward to collaborating with TAFE SA to bring nation-leading maritime education to help create more opportunities for more South Australians to participate in the growth of the shipbuilding industry,” he said. TAFE SA also recently signed a memorandum of understanding with the French public vocational education and training provider AFPA, which is a leader in the maritime sector and is partnered with major French shipbuilders.